My parents’ group is abuzz with talk of starting solids. We all want to give our bubs regular solid meals with a range of foods, but the thought of the constant cleaning up is exhausting. Lucky me, I’ve found this smock that will mean less mess and more fun with food. Little kids long to play with their food, it is how they learn about tastes, textures, and get the motor skills needed to feed themselves. But letting them feed themselves means extra mess, right? Not with the Messy Mealtime Smock from Little Chomps. Don the smock, unleash the foodie fun, then just whip it off and voila! Clean kid, happy parent. This smock is waterproof, but not made of plastic. 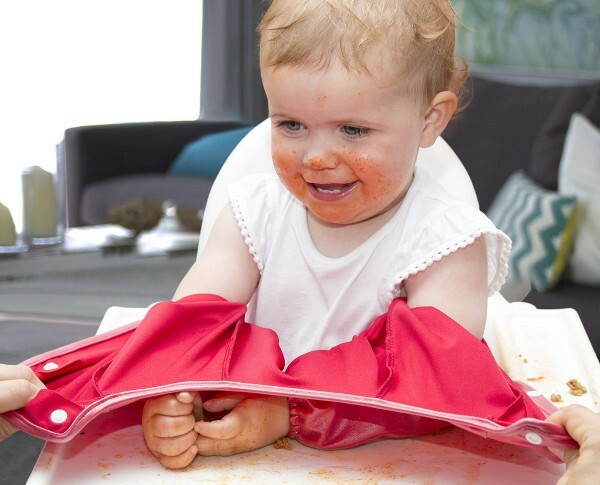 BPA and PVC free, the Messy Mealtimes Smock is made from breathable, biodegradable fabric that is not stiff and crinkly, but folds away easily. No velcro that can get caked with food and caught in hair, there are buttons in back of this beauty. Best of all this oh-so-practical smock is wipeable and machine washable. 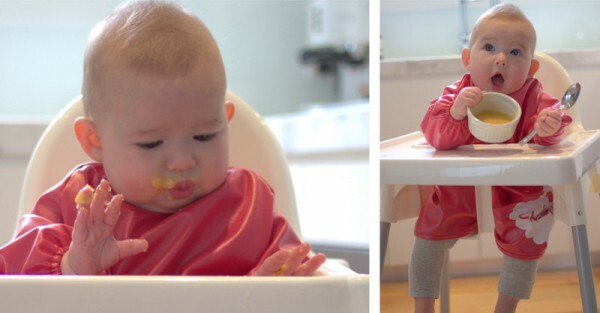 Messy Mealtime Smock is available in three colours – raspberry red, lollipop pink, and bubblegum blue. They are a good size that can cover kids from their wrists to their knees from around six months to two years of age. Of course, you don’t have to wait until mealtimes, these smocks are great for all kinds of messy activities. Made by local Melbourne mum Bree McKay, you can grab one at Little Chomps for just $24.95, plus shipping. Worth the investment for all the time you will save cleaning kids and clothes.